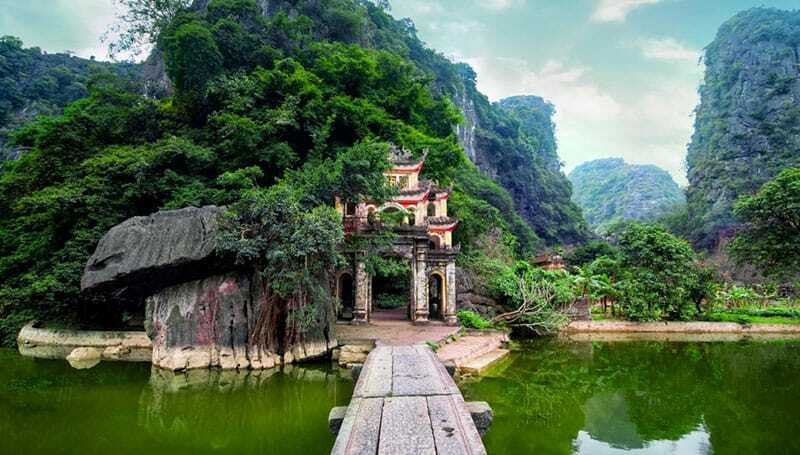 Tam Coc is considered as the most attractive destination in Ninh Binh, also known as other name “Halong bay on land”. Tam Coc (literally meaning Three Caves) include Hang Ca (first cave), Hang Hai (second cave) and Hang Ba (third cave). 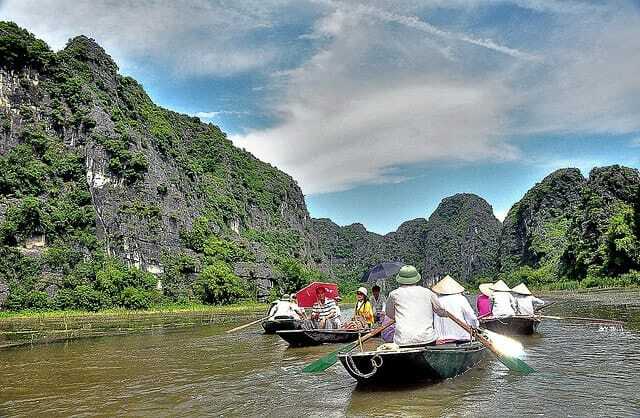 All three caves are formed by the Ngo Dong River flowing through the mountain..
It’s about 90km away from Hanoi city, and the best way to discover Tam Coc is on a small rowing boat. The trip will take about 2-3 hours to travel through all of three magnificent caves. 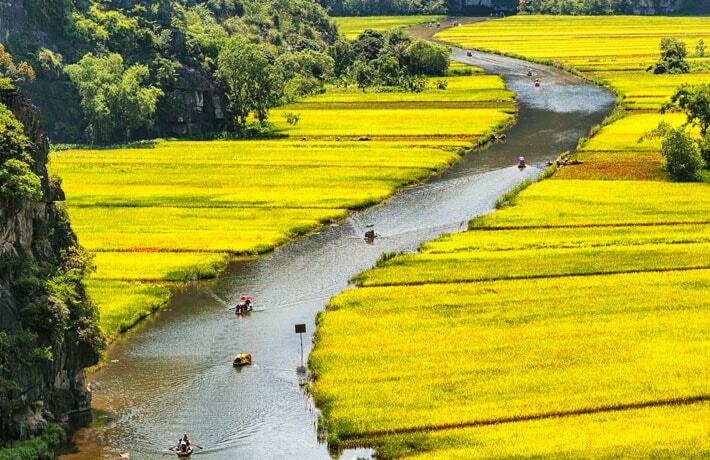 The best time to visit Tam Coc is from late April to June when the rice fields is growing and turn yellow. 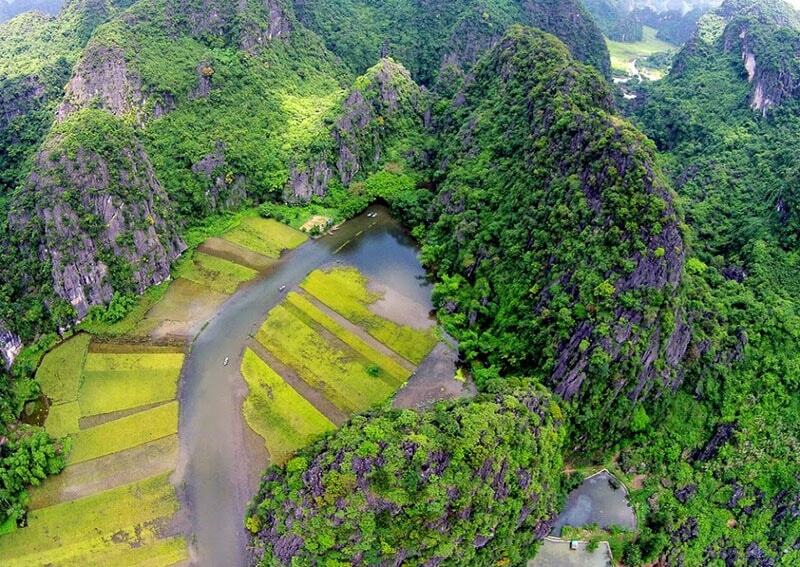 The boat ride takes us along the winding Ngo Dong River, you can admire two riverside with golden rice fields, the view of the rocky mountains or you can watch closely into water with the abundant aquatic species fluttering under the water. The boat will take you through Tam Coc (three caves). Firstly is the Hang Ca with 127 meter in length, crossing through a huge mountain. Its mouth is 20 meter wide and the climate inside the cave is so cool. You can easily see the stalactites hanging down magically in various shapes. The next is Hang Hai, about 1km away from the Hang Ca. This cave is 60 meter in length and also full of beautiful stalactites. Finally is the Hang Ba nearby Hang Hai with its ceiling is so low compared to the other two caves that it looks like a stone arch. Bich Dong Pagoda, an ancient pagoda attached to rock mountain, about 2 km from Tam Coc wharf. The pagoda is built in the style of “Tam Toa” (three pagodas). At the foot of the mountain, the lower pagoda (Chua Ha) with typical oriental features, the roof of the pagoda is two-tiered curve. Follow about 120 stone steps, you will come to middle pagoda (Chua Trung), a very unique pagoda with open half and half of which is attached to the cave. Continue on 40 steps, you go to the Upper Pagoda (Chua Thuong) in the highest position, the worshiping place of Quan Yin Buddha.